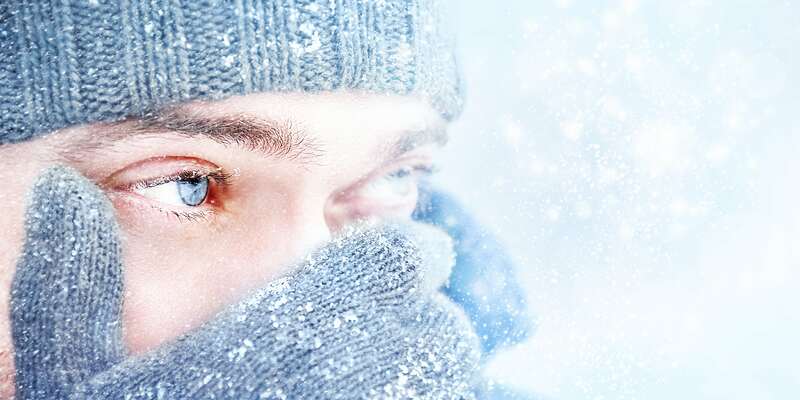 Your Eyes Need Special Winter Care, Here’s How To Help Them Survive The Chill! The winter months are coming, and it’s a good guess that you’ve already taken the necessary steps to update your wardrobe with warm coats, leggings, and cozy hats. While you were taking all that time worrying about the health of the rest of your body, did you stop and consider that your eyes may need preparing for the cold weather as well? If not, don’t feel bad, most people don’t know that the cold weather season can affect your eyes as surely as it can chill your bones and that there are things you can do to protect them. Follow us as we explore the risks of cold weather to your eyes, and what you can do to ensure your eyes have a great winter too! Whether you’re outside in the cold, dry winter air or are locked away in a heated office with air like the Sahara Desert, your eyes are going to pay the price. Even if you usually don’t have need of them, it pays to have saline drops around to help them feel better, but you can also make sure you take omega-3 supplements and drink plenty of water. If you have the option, you might want to consider a humidifier for your home. For some people, winter is the season of excessive and unnecessary tearing, and they may not even realize that it’s something they have control over. Winter tears tend to be the result of seasonal allergies, cold air, and bitterly chilly winds. You can help control some of this by merely wearing sunglasses against the icy winter glare, but eye drops or allergy medicine may be appropriate in your case. Discuss this with your ophthalmologist. If you live in an area that gets a lot of snow, you may find this to be especially true. With frost and ice forming, and a layer of winter snow, the sun may not be up as long, but it can seem even brighter than the brightest summer day. This can lead to excessive blinking, discomfort, and in some people, it can also lead to sneezing. Be sure to protect your eyes with sunglasses when the winter sun gets exceptionally bright. The drop in temperature can actually change the way you see as the cold weather causes the blood vessels to constrict in and around your eyes causing blurriness and double vision. These symptoms most commonly appear when you’ve been spending a lot of time out in the cold winter chill. If you start experiencing these symptoms get inside and let yourself, and your eyes, warm up before braving the cold again. If your vision remains changed after 30 minutes get to a physician immediately. These are just some of the ways that winter can affect your vision. If you want to learn more about caring for your eyes during the cold winter months, schedule an appointment to see Dr. Paul Trapeni at The Optical Shoppe in Smyrna, TN. They’ve been helping patients like you enjoy the coldest months of the year while protecting their vision, just like they do all year round.